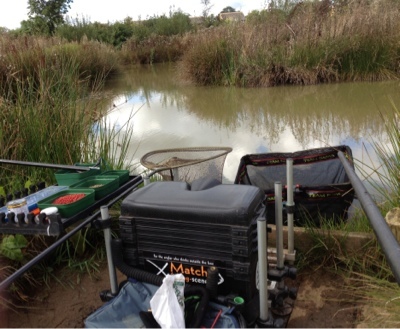 The 7th match at Hemlington lake with Anglers Cabin. Having had a nostalgic journey back to this childhood venue and being free on Sunday I decided to venture back to Hemlington Lake with the Anglers Cabin crew. The weather over the weekend was starting to get colder and a frosty scene greeted me when I woke up. It will be all about the silver fish today I thought to myself! The car also had a layer of frost which I decided to defrost from the comfort of the driver seat with all the warming devices switch to maximum heat. Nine lads turned up to brave the cold weather. I drew out peg 3, so a very short walk for me this time. My neighbours for the day were Adam on Peg 2 and James on Peg 4. Peg 3 had an island chuck for the feeder and I decided to fish 14.5 metres out due to the gin clear water. Deciding to fish locally again this weekend and reviewing the Carrs Angling Lakes website I noted they have a regular Saturday match. The fishery is 10 minutes from my home so it wasn't an early start and I arrived at the fishery for 9:15am. Worryingly there were very few cars in the car park and nobody milling about who looked like they would be fishing a match. So with no match on, I thought lets have a change from the carp lakes and try out Carr's Silver Lake. The weather had taken a change and there was frost on the ground for the first time this year. I chose peg 12 on the Silver lake which gave me an option to fish both the cut between the island with 13 metres and also the open water ahead with 6 metres. Bait for the day, micro pellets, red and white maggots, 4.5mm and 6mm expander pellets. Again, Andy and Sarah Kinder had this well organised. 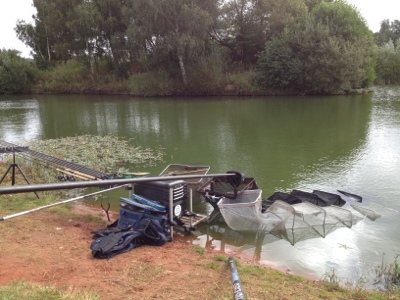 Those anglers who had fished the Match or Arena lake where to draw from the Specimen lake bucket and vice versa. Two semi-orderly lines formed and I drew out Peg 56 on Specimen lake, two thirds the way along the Chalet Bank. Neighbour for the day was Anthony, who I was pegged next to the previous year along with Bob Poole... I wonder if I could reclaim this £1? With so many anglers and the late arrival of Jason who had all the match sheets, Andy and Sarah Kinder did a cracking job of getting us all registered, pools paid and generally organised. 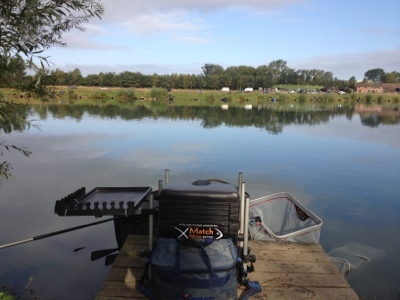 I drew out Match lake, permanent peg 28, an end peg plus it was the peg that won Les Thompson the £50,000 first prize on Maver's MatchThis competition. My neighbour for the day was none other than Bob Poole, who I sat next to at last years Larford Lash-up. Maybe a chance to win my pound back? 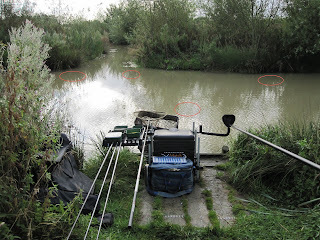 In my quest to fish more local venues, the lads on the Anglers Cabin forum have started a monthly match at Hemlington Lake in Hemlington, Middlesbrough, so I put my name down. I last fished Hemlington Lake back in 1988, some 24 years ago! The lake has changed quite a bit since then... a number of floating islands have been put in place to help protect the fish stock from Cormorant predation. Fishing swims are now clearly pegged out with staging. There is plenty of bird wildlife on the lake and the vegetation around the lake is really well established. More details on Hemlington Lake and activities around the area can be found on this link. After 2 months of not fishing due to work commitments I finally got back on the bank and visited my first really local venue, Carrs Angling Lakes, just off Letch Lane, Stockton, before you reach Carlton Village. After chatting to a couple of local gents and walking around the Match Lake I decided to fish Peg 17. Left side far bankCut opening far bankRight side far bank5 metre line Bait for the day was Corn, Pellets and a pint of white/red maggots. The Session I cupped in a small pot of micro pellets, 4mm pellets and a couple of grains of corn on the left side far bank swim, cupped in around 20 maggots on the right side far bank swim and would feed the 5 metre line by hand with a 4mm pellets. After applying for 4 Fish O Mania tickets this year, I managed to secure only 1 ticket for the final qualifier at Lindholme Lakes in Doncaster. I arrived early, around 7am and was front and centre in the queue which as the morning progressed and the clock came around to 9am got longer and longer... The banter in the queue was great and just goes to show what a friendly bunch of people anglers can be. My hand went into the very full bag and out came Peg 57 on Laurels. I'd fished Laurels before during the week with the Maggotdrowning crew so I had a basic idea of what to expect.